It’s no secret that I don’t enjoy cleaning or organizing things. Luckily, a great benefit of living with less is … less cleaning and organizing. By living with less, I don’t have to search for my things, reorganize drawers, and closets or shuffle papers. There are many ways to simplify your life and decluttering helps you set the stage by giving you more time and space to take the next steps. 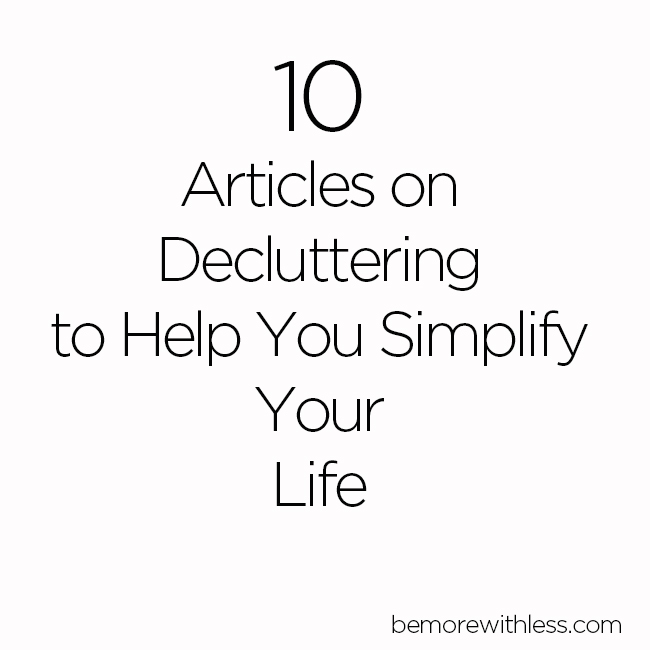 Find inspiration in these 10 articles about decluttering. Try these tasks once a month, in addition to your other decluttering efforts. You don’t have to do all of them, but choose a few that resonate with you to be part of your adventure in discovering a simpler, clutter-free life. If you have young children, this experiment is for you. Things still feel sentimental to me, but now it’s mostly moments, glances, rising new moons over mountains, ocean sunsets, and precious words. #1 made the biggest difference in my life. I love the research behind decluttering shared in this article along with 8 helpful recommendations. If you feel overwhelmed or confused about the benefits of decluttering, simply remember that your home is not a container for your stuff, but rather a place for joy and connection. I can’t think of a better reason to declutter than to make room for more of that. If you want to experience all the benefits of a clutter-free life, 50% is a great place to start. It sounds extreme, but once you start moving from room to room and removing the things that don’t matter and that you don’t care about, you’ll reach the half way point sooner than you think. There are some tips in this article to help you banish fears about giving away that much too. Miss Minimalist’s Francine Jay says, “Of course, from an environmental standpoint, it’s best to keep your castoffs in your community; the fewer things we ship around the globe, the better. Therefore, I strongly encourage you to check out local options for your unwanted items: like churches, hospitals, schools, libraries, animal shelters, homeless shelters, women’s shelters, halfway homes, food banks, senior centers, day cares, prisons, and charity shops. Great list! Thanks so much Courtney! I really enjoyed Back to Basics Decluttering—especially “start with the simple.” Sometimes all we need is that little motivation—and that little empty space—to become energized and enthusiastic about decluttering. I know this was how I started…I started with the small wins, and worked up to the more difficult things, like gifts and sentimental items. Seeing empty cupboards, clear surfaces, and space was so rewarding, it gave me the courage to embrace decluttering the more challenging areas of my home. I liked the clutter busting routines and getting rid of toys posts. We’ve started doing some pre-Spring cleaning around here and want to involve the whole family. Thanks for these great resources! Thank you for all the articles … helpful tips for a more carefree life. Courtney, thank you for the clearinghouse of excellent posts and also for a blog that NEVER leaves me feeling “less than” or lacking or bad in any way. You are a gem!